Kingswood Oxford made it to the Final Four! Of the Middle School Mock Trial competition, that is. We're one of four middle schools competing at the state level in the last week of April. Parent mentor Teresa Ravalese said, "I've said to the team that winning is an attitude, not a result. Each member of the team made an important contribution to the day's outcome." Parent mentors Ms. Ravalese and Ryan Costantini and teacher Lynne Levine tirelessly support the team on Tuesdays, Thursdays and Sunday practices. Costantini said, "I'm very proud of this group. 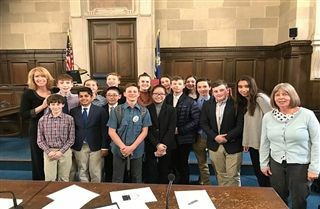 2019 is the most successful year we’ve had with both the Upper School and Middle School Legal Wyverns making it to the Final 4." Mock Trial elevates students' critical thinking and public speaking skills so that students can develop cogent and thoughtful arguments to present and win their cases.